Media Vision's demo boardroom in its new facility New York City Media Vision has established a presence in Manhattan, with 12 permanent staff members at its new location, supporting local clients. Media Vision moved to a new office location earlier this year due to expansion, and celebrated its open house in May of 2016. The new office, situated in the heart of Midtown in New York City, houses a training facility for all of its conferencing products and services. This facility enables clients to experience products firsthand in a controlled boardroom setting, with preset software to get an understanding of what the products will look and feel in their own meeting spaces. 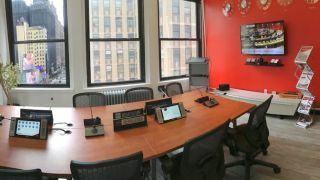 Fully equipped with Media Vision’s wired, wireless, and multimedia conference microphone systems, simultaneous interpreting, assistive listening, and a multichannel streaming and recording solution, the New York Training Facility is a resource for integrators to use for pre-sales activities, and can also be used as a post-sale facility for clients and end users to get a hands-on experience with the different features of their selected solutions. The demo systems feature the full version of all TAIDEN product lines, so every feature is always available for an impromptu client visit and can be customized for each presentation needs. Media Vision has three additional offices in North America and four in Europe.